Often called the roses of spring, ranunculus flowers are a crowd favorite! With layer upon layer of petals, these darlings are both delicate and showy. If ranunculus blooms were people, we imagine they’d be the elegant, charming type who are gracious and hospitable — they throw the best dinner parties and make it look effortless. We are excited to share more about their characteristics and symbolic meanings as this month’s featured bloom in our “Language of Flowers” series! The name ranunculus stems from the Latin “rana” meaning frog, and “unculus” meaning little. If you imagine these blooms growing abundantly along streams like little frogs in the spring, the name seems quite fitting. They are also often called buttercups, which is another species in the same genus. These fairy tale blooms symbolize radiant charm and beauty. In Victorian times, people would give them to someone they were attracted to as a way of saying “I am dazzled by your charms.” They’re the perfect “I have a crush on you” flowers. I have to admit that I only knew the blooms from photographs when we first started making them in paper. They have a gazillion petals, which we attach in many layers, making them a fairly hearty and sturdy bloom. (Fun fact: my mom drilled a tiny hole in her work table, and she likes to insert the wire stem through it to hold the bloom as she glues on all the petals). When I finally had the chance to play with live ranunculus, I was surprised at how truly delicate they are! The petals are incredibly thin, and the stems are hollow. You must handle them carefully so you don’t bend or break them. It’s hard to believe, but these sweet blooms are actually poisonous if eaten fresh. Ranunculus blooms come in many colors. In our Signature Collection, we create them in cream, blush, pink, magenta, orange, gold, and peach. And we’ve just added a new coral pink shade in our Seasonal Collection for spring/summer this year. Colors hold their own symbolism, which enhances and shifts the bloom’s meaning. Orange, for example, signifies happiness and positive energy. Bouquets with our orange, gold, or peach ranunculus would add a touch of cheerfulness and optimism to a space and would make a lovely gift to decorate a home or office. 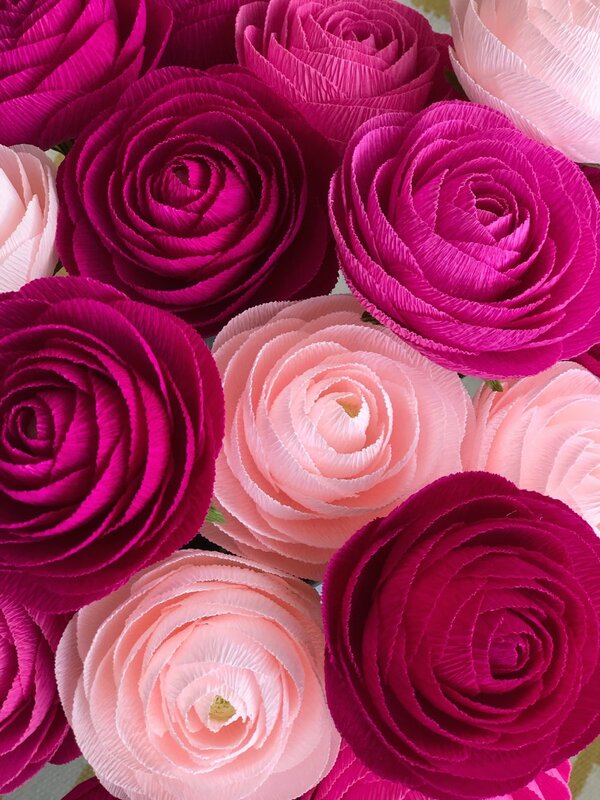 Pink symbolizes love and gentle feelings, making our pink, blush, and magenta ranunculus a sweet gift for a mother, friend, or significant other. Or, your can always pick out your own bouquet recipe and include as many ranunculus as you’d like with our Build Your Own Bouquet option! Interested in learning the meaning behind another bloom from our Signature Collection? Leave us a comment and let us know which flower you’d like to see us feature next!